He had a rough start to his young life, surrendered to the Kelowna SPCA for being too active when he was still a puppy. 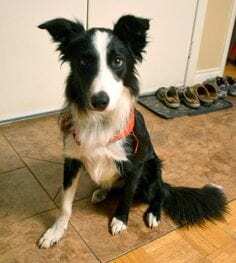 Border – named after his breed, the border collie – has come a long way from the underweight and fearful 15-month-old who went into foster care through the Kelowna BC SPCA Branch in 2014. Border collies are a highly intelligent and active breed, notes Kelowna BC SPCA Branch manager Suzanne Pugh, and when they get bored, they can develop behavioural problems, such as “fly-snapping,” a condition where the dog will snap at the air, like they’re trying to catch invisible flies. It was a behaviour Border displayed, but that didn’t stop David and Bridgette Yates from taking him into foster care. 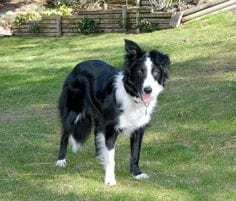 The Yates had lost one of their two border collies six months before, and they went to the BC SPCA in search of another companion for their remaining dog, hopefully one who could compete in agility. At first Border didn’t show much promise for agility. When he first arrived home, Border seemed like he was afraid to make a mistake, and he was even afraid to bark, says David Yates. Now, the two-and-a-half-year-old has a lot more confidence and his fly-snapping is under control, and he competes in agility with a lot of skill. He was entered in a local trial in March, where he received his first title: Agility Dog of Canada. This allows him to move up and enter more advanced competitions. With more trials planned on Vancouver Island and in Abbotsford, Yates says Border looks forward to competing in the agility ring.